Welcome to the TCPS Montessori Pre-School Summer Camp. At Town Centre Private Schools we have a fun filled summer for our pre-school students starting as young as 18 months. Numerous activities are scheduled to incorporate academics and fun into a well-rounded, complete day for the campers. 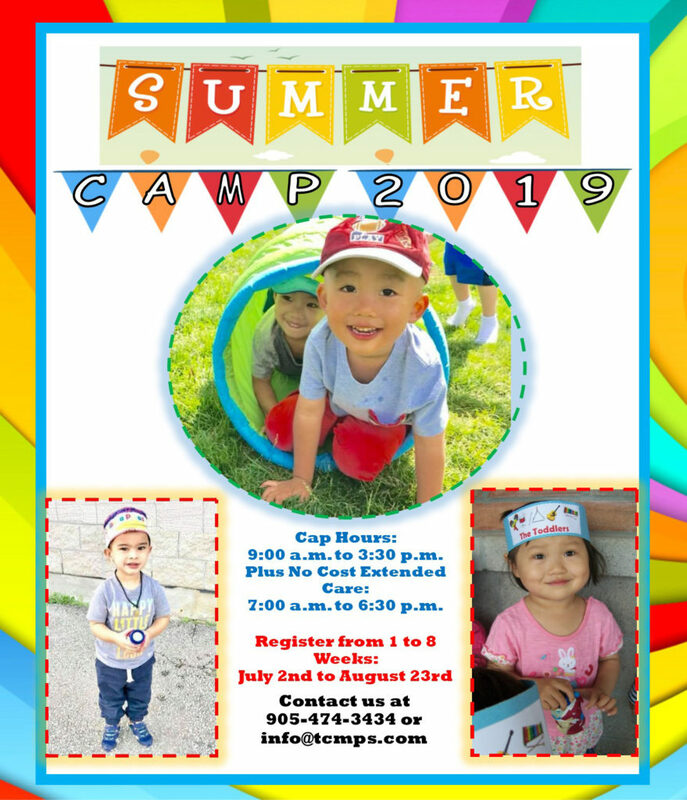 The 2019 Summer Fun Camp will operate for 8 weeks, beginning July 2nd and finishing on August 23rd, 2019. Students may enrol for the half day or full day program and students over 3.8 years of age have the option of attending 3, 4 or 5 days per week. Parents may register weekly, from 1 to 8 weeks. The Summer Camp hours are 9:00 a.m. to 3:30 p.m. The before school hours (7:00 to 9:00 a.m.) and after school hours (3:30 to 6:30 p.m.) are included at NO EXTRA COST. During our 8 week Summer Camp program, we will continue to offer our Hot Meals program catered through Kid’s Kitchen. Kid’s Kitchen is a renowned catering company for schools, and is located right here in Markham. The Kid’s Kitchen Hot Lunch program is a specialized lunch and snack service for school children. Lunches and snacks are prepared fresh daily by Kid’s Kitchen and delivered to the school. Parents simply order online at www.kidskitchen.ca from a 4 week rotating menu complete with a nutritional morning snack, hot lunch and afternoon snack. Please note that the Hot Lunch program is mandatory for our Toddler, Pre-Casa and Casa students. It is our aim to offer a summer program that will build upon student experiences at school and at play, as well as offering opportunities for students to share their talents. We are sure our campers will make lots of new friends and take home lasting memories! Summer Camp students who did not attend the School during the regular school year will also need to complete and submit the Montessori Pre-School enrolment forms. * Register by April 1, 2019 for 3 weeks and save $50.